Alaska is a true bucket list destination with one of the most stunning and awe-inspiring coastlines in the world, making it an incredibly popular fly cruise and stay package. There is so much to see and do on an Alaskan cruise, from watching the local wildlife roam free or experience once-in-a-lifetime encounters with rare humpback whales. Whichever level of service you prefer, you will no doubt have a fantastic experience with both tiers offering an overnight stay in Kamloops, as well as transfers, as part of the package. You can sit back and enjoy commentary from the onboard attendants, while complimentary drinks, both alcoholic and non-alcoholic, breakfast, lunch and snacks are served during the journey. 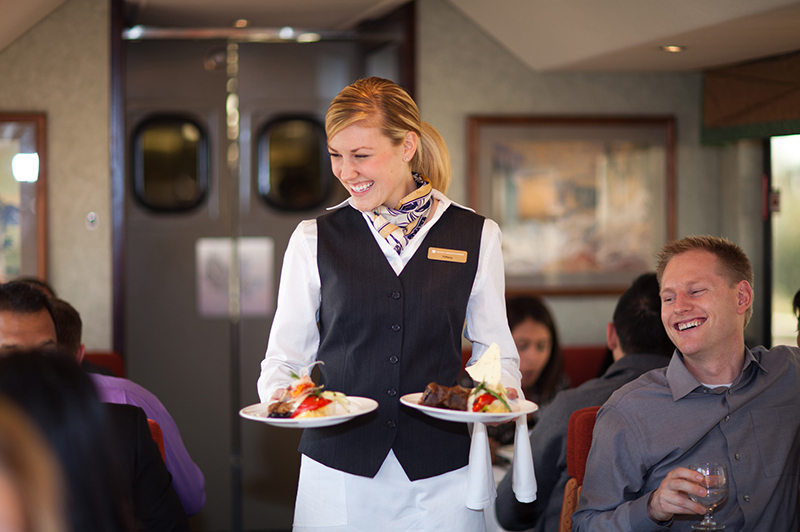 Check out some insights below from Rocky Mountaineer experts! 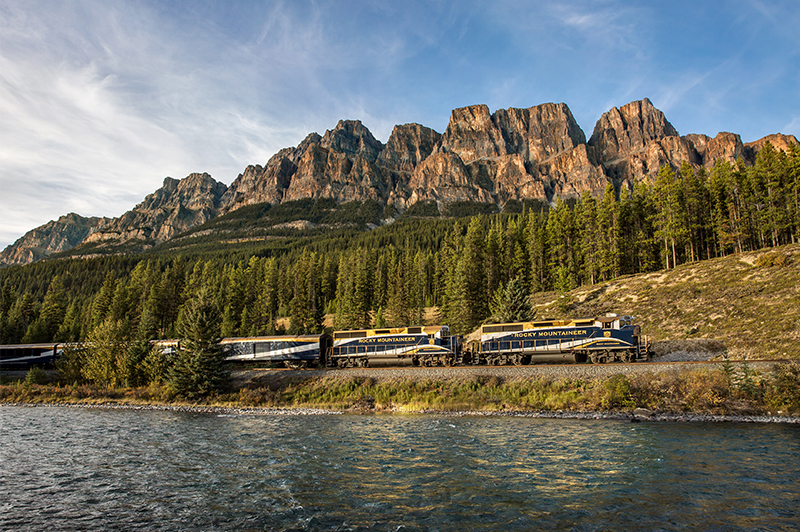 "No two Rocky Mountaineer journeys are ever the same. With such a variety of wildlife to see, food to sample and superb service to enjoy. You'll never go hungry onboard with homemade snacks served between meals. You'll take more photos than you ever could have imagined, just be sure to bring a spare camera battery!" Choose your journey and experience a unique Rocky Mountaineer journey through the stunning landscapes of North America. 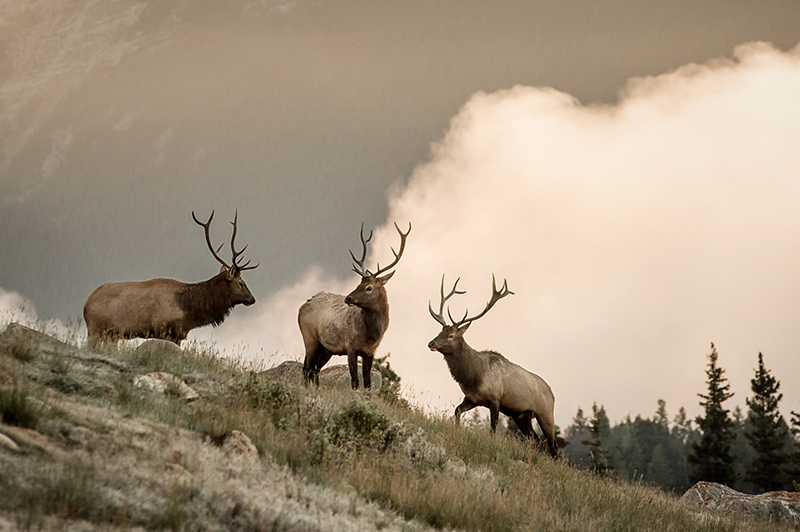 Have your camera at the ready for some optimal wildlife spotting and awe-inspiring natural backdrops. 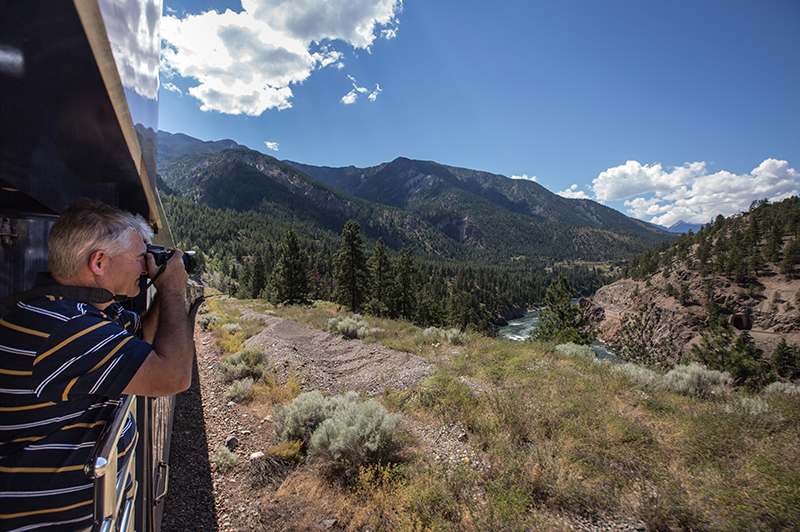 GoldLeaf Service offers the ultimate Rocky Mountaineer experience, with the custom designed, bi-level dome coach boasting unparalleled panoramic views. 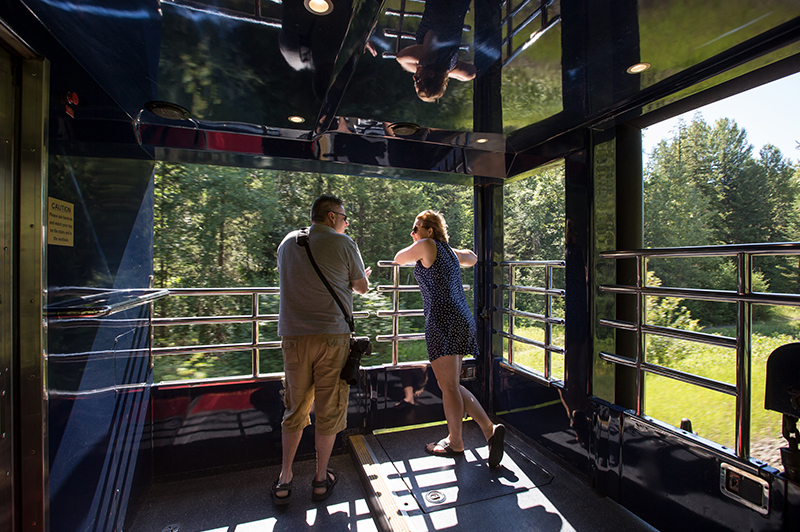 You can step out onto the covered vestibule to take in the fresh mountain air or take photos of the dramatic and beautiful scenery. You journey starts with a morning toast before indulging in the wonderful à la carte menu offering gourmet cuisine during breakfast and lunch, served in the comfort of the GoldLeaf dining room. GoldLeaf is also available as a "seat-only" upgrade, meaning you will still stay in the same superb SilverLeaf hotels but will travel in GoldLeaf onboard the train. As a GoldLeaf customer you can also enjoy complimentary alcoholic drinks and snacks throughout your journey and your luggage will be delivered to your hotel for the overnight stay in Kamloops. You will also benefit from staying in a wonderful selection of Fairmont hotels throughout your holiday, including the iconic Fairmont Banff Springs, the Fairmont Vancouver, the Fairmont Chateau Lake Louise (only on the Highlights of the Rockies) and the Fairmont Palliser Calgary (also only on the Highlights of the Rockies). SilverLeaf Service offers huge panoramic windows from which you can take in the incredible scenery on this journey in the custom designed single-level dome coach. The journey starts with a morning toast follow by a hot breakfast and lunch, served at your seat with complimentary snacks throughout your journey. 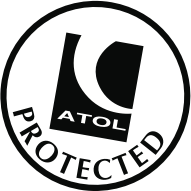 Again, as a SilverLeaf customer, your luggage will be delivered to your hotel for the overnight stay in Kamloops. We have combined these two wonderful destinations together by offering two itineraries with Rocky Mountaineer and a selection of Alaska cruises, including the popular Inside Passage and Glacier Bay. You can choose between taking a pre-cruise journey, beginning in Calgary and finishing with an Alaskan cruise, or you can cruise this stunning coastline first, then board the train in Vancouver, finishing your journey in Alberta. We are currently offering various packaged tours, including our most popular First Passage to the West and the Journey Through the Clouds. 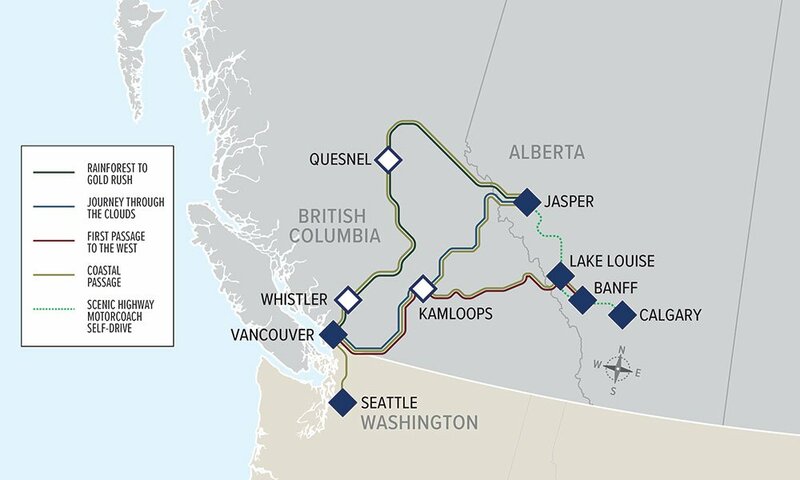 The First Passage to the West traverses four fantastic destinations along its stunning route, Vancouver, Kamloops, Lake Louise and Banff. With so many jaw-dropping excursions along the way, including sightseeing in Yoho park and a summit helicopter tour, this is a historic route where the Rocky Mountaineer is the only passenger train to pass through. On the other hand, Journey Through the Clouds offers a 2-day all-daylight experience onboard Rocky Mountaineer, spanning Vancouver, to Kamloops, to Jasper. This is a fantastic showcase of vast valleys, thrilling rapids and the spectacular Mount Robson, the highest peak in the Canadian Rockies. There is no shortage of opportunity to spot undisturbed wildlife in their natural habitat, so don’t forget your camera! Conclude your journey with a stay in Vancouver, before making further arrangements for your Alaska cruise, or your flight back home. For those looking for something truly unique our team of experts can also tailor-make your journey to suit your requirements, with additional overnight stays or a journey on one of Rocky Mountaineer's other itineraries including the world famous mountain resort of Whistler. 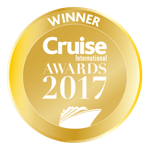 View our fantastic selection of cruise and stay packages featuring Alaska and Rocky Mountaineer, or contact one of our expert team members for more information.